The Bearish Three Black Crows Pattern is indicative of a strong reversal during an uptrend. It consists of three long black candlesticks, which look like a stair stepping downward. The opening price of each day is higher than the previous day's closing price suggesting a move to a new short term low. 1. 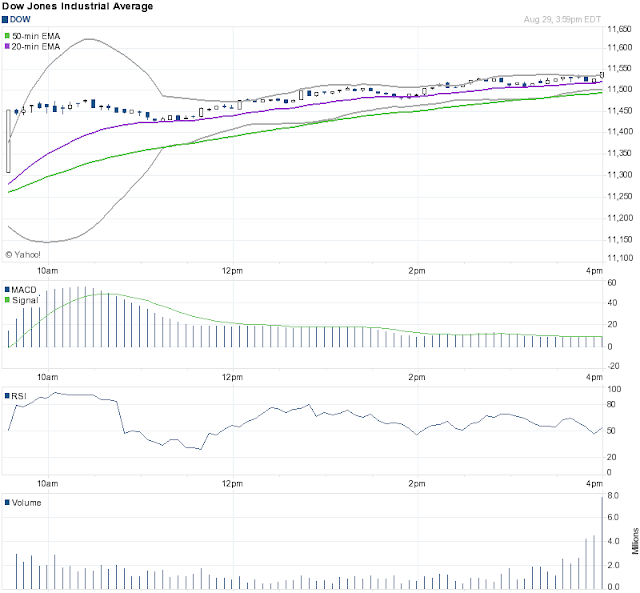 Market is characterized by uptrend. 2. Three consecutive long black candlesticks appear. 3. Each day closes at a new low. 4. Each day opens within the body of the previous day. 5. Each day closes near or at its lows. 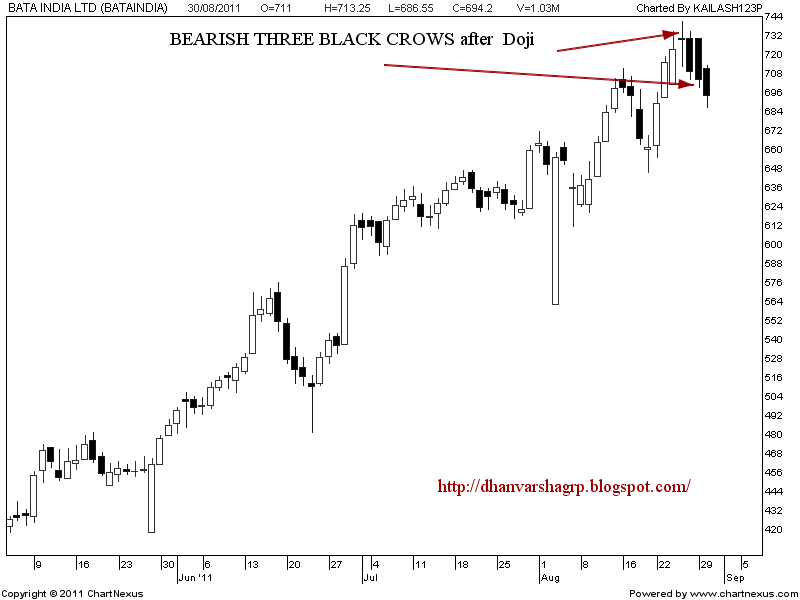 The Bearish Three Black Crows Pattern is indicative of the fact that the market has been at a high price for too long and the market may be approaching a top or is already at the top. A decisive downward move is reflected by the first black candlestick. The next two days show further decline in prices due to profit taking. 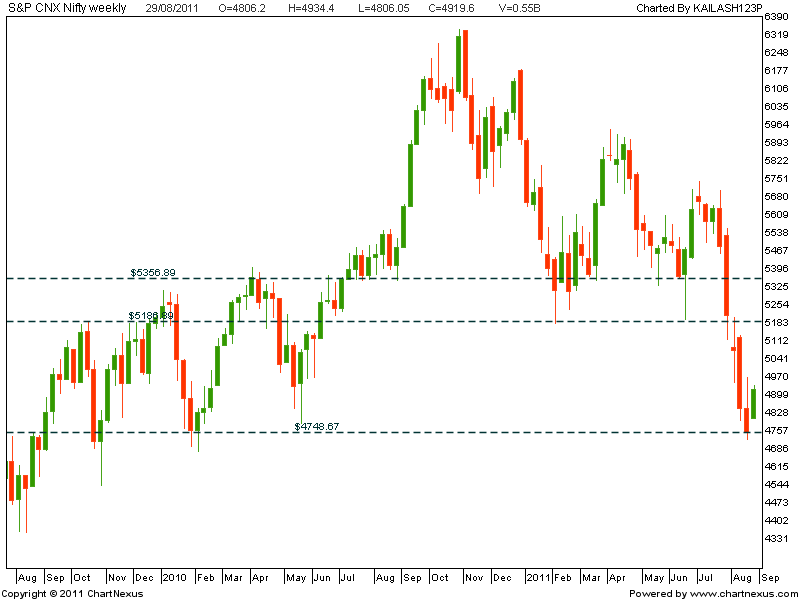 Bullish mood of the market cannot be sustained anymore. The opening prices of the second and third days can be anywhere within the previous day's body. However, it is better to see the opening prices below the middle of the previous day's body. 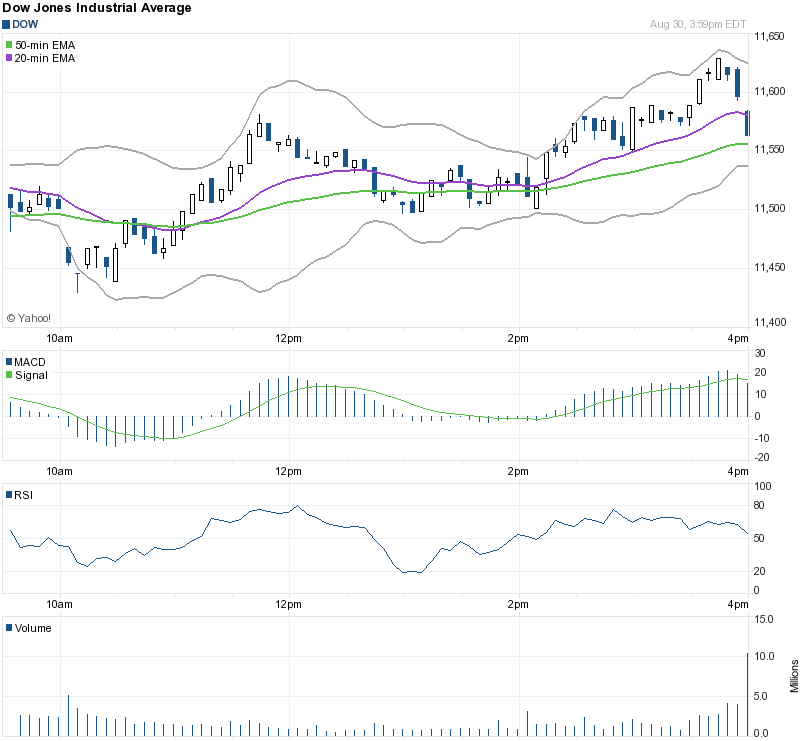 If the black candlesticks are very extended, one should be cautious about an oversold market. The reliability of this pattern is very high, but still a confirmation in the form of a black candlestick with a lower close or a gap-down is suggested. Bata India can touch Rs 732, says Siddhartha Chatterjee of Trustline Securities. 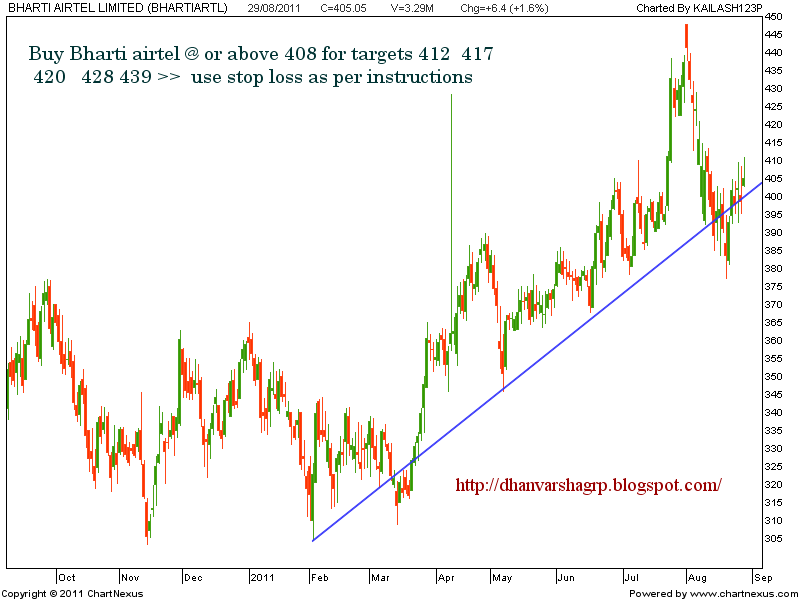 He further added, “If we keep a stoploss at Rs 694, we could possible from current price levels achieve a target at Rs 732. Stock is trading above historic highs and it’s a good idea to trade on the long side of stocks which can cause historic highs by basic parameter of trading technology." Stocks rallied for a third straight day Tuesday as news the Federal Reserve considered a more aggressive course of action at its last meeting countered a weak read on consumer confidence. European Central Bank and the International Monetary Fund has helped quell investor concerns," he added. who was saying it is a dead cat bounce !!!!!! U.S. stocks climbed Monday, sending the S&P 500 Index to a close above 1,200 for the first time in two weeks, on relief that damage from Hurricane Irene wasn’t more severe and that Fed Chairman Ben Bernanke did not see an immediate need for a third round of quantitative easing. Bernanke “was perfect in not discussing QE3; that kind of soothed the markets into thinking, ‘Well, maybe we’re not going into recession,’” said Jeffrey Saut, chief investment strategist at Raymond James & Associates, of the Federal Reserve chief’s address to a gathering of central bankers from around the world Friday. Nifty gap is filled..Ready to take off ..
Daily nifty chart is showing that gap is there..
Nifty futures daily chart ..preview..
Bata India . 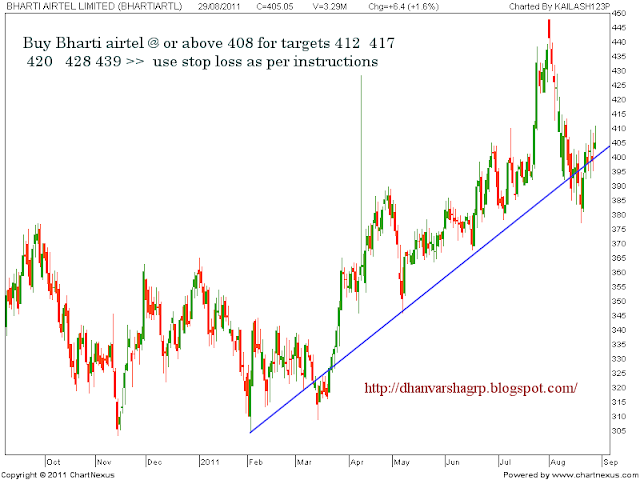 sell at each swing high ..
Buy deltacorp at or above..
buy reliance capital at 459 - 460 .